Matayoshi School is sometimes generally used to define Okinawan Kobudo. 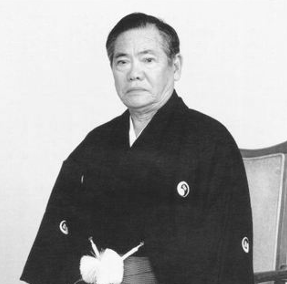 Based on the familial traditional way of kobudo practice (more than 9 generations) Shinko Matayoshi received the request to perform a demonstration to the future Emperor in 1921 . Hiro Hito was really impressed and authorise Matayoshi family to use the Imperial Seal (kiku flower – Chrysanthemum Seal) for Okinawa Kobudo. Matayoshi School Emblem is a merge of Imperial Seal and Ryukyu Island Emblem (mitsu domoe). Shinko Matayoshi died in 1947, his son Shinpo decided to continue Kobudo teaching and in hoor of his father he named matayoshi dojo Kodokan (光道館). Shinpo dedicated his life to Kobudo growth with a great succes as nowaday there are more than 2,000 Kobudo Dojos over the world. This a fantastic achievement for a martial art created in the 16th Century.